I have never been one who exercised in a traditional way. So for me to decide to use bicycling for exercise as a new routine in my life is really out of character for me. Why am I beginning this new regimen? Am I in poor health? I recently celebrated my 60th Birthday and I also retired from my day job at the end of last year. I have always been a pretty active person and got my exercise each day in the activities that I did, rather than doing traditional exercising. So, my decision to start using bicycling for exercise is more to maintain the health that I already enjoy. Since I find that I am sitting in front of the computer much more with my writing, I need something to keep my body in the shape that it is in now. Doing jumping jacks, lifting weights, or rolling around with a Pilate ball is just something that I would not stick with. I know myself well enough to know that I would soon get bored with it and just not do any of them. When I was a kid, I practically lived on a bike! It was something that I always loved doing, riding a bicycle. So, this seems like a nice fit for some aerobic exercise that I will stick with. 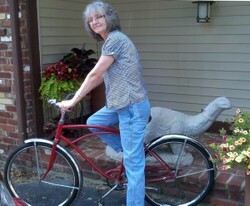 I figure that riding a bicycle will help me keep the little bit of arthritis that I have in my knees and hips at bay. I have read that one of the best ways to combat arthritis is to stay active. My plan is to ride my bike at least three times a week. I won't be riding in any races and I don't plan to ride really fast. Just a nice leisurely pace that gets my heart pumping, my lungs working harder and my legs moving. My neighborhood is a lovely rolling area with quiet streets. Let me tell you, those rolling little hills gets the old lungs working and the heart pumping. Not to mention the "burn" I feel in my upper legs going up a hill. But that is good! The nice thing is that my legs don't kill me for the rest of the day after I have ridden my bicycle. Not like if I had gone to a gym and done a bunch of machines that had me sore for a week later! In less than a week I have already worked up to riding about 2 1/2 miles on my bicycle without killing myself while I do it. That is part of my plan, work up to riding a longer distance. Once I am no longer feeling the burn in my legs from the hills, I can then progress to longer distances while getting more exercise. There are some gorgeous bike trails close to me that will be fun to ride on. Why A Cruiser Bicycle For My Exercise? Well, for one thing I think the vintage bicycles are way cooler than the new bikes but that is just me. A bicycle that is known as a cruiser is one that allows you to sit upright rather than hunched over. Also, a cruiser has the fenders to stop water or mud from being tossed up onto your clothing and there is a chain guard to keep your pants clean and from getting caught in the chain. I plan to "pimp" out my vintage bike with a basket and some trimmings but that is another article all together. Have you considered bicycling for exercise? Great article, bev-owens! Cycling is fun and useful! I pretty much enjoy it as well! Cheers! Oh, Bev, this is great! I love your bike. I prefer the older models, too. I guess it's what we got used to as kids. I'd love to go for a bike ride with you. I think that bicycling is one of the best ways to exercise and I love that bike of yours! 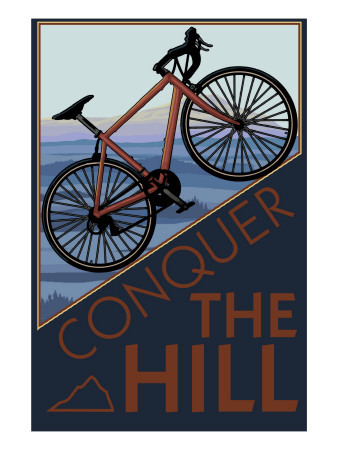 I'd love to do it too, but the "hills" around here are a bit steep without using a bike with gears and even then, I'm afraid I wouldn't get far before I'd have to walk - pushing my bike. Have fun Bev!